There’s an iconic scene in the 1953 Audrey Hepburn movie Roman Holiday where the star – a bored princess looking to shake off the shackles of her duties – hops on a Vespa for the first time and, after a shaky start, zips through the narrow streets of Rome howling in delight. We’re not in Italy, and I’m not wearing a jaunty neckerchief, but I am leaning into a hairpin bend on my ladybird-red scooter, an open road before me, the rustic hills of Spain’s Ayllon mountains blurring past as I whoop a muffled cheer into my crash helmet. Welcome to flashpacking. The idea of this particular trip – our nine-strong group consists of two couples, a 29 year-old woman, a thirtysomething guy, plus me and two local tour guides – is to do for touring holidays what glamping has done for the tent industry. That’s to say eliminate the dirty work and give them a much needed cool-over. It’s less about makeshift hostels, gap year students and rucksacks, more about boutique hotels, young professionals, fine wine and authentic food. And it doesn’t get much cooler than a shiny red Vespa 125cc automatic (which, FYI, means ‘wasp’ in Italian). There’s no denying the visual impact of our red, yellow, red, yellow line-up of sleek Vespas glinting in the Spanish sunshine against a barren backdrop of sandstone brick buildings and dusty roads. We’re an hour’s drive north of Madrid and it’s Day One. We’ve stopped for a glass of rioja and some spicy chorizo, calamari and patatas bravas tapas at the quaint but perfectly-catered Restaurante las Murallas in the sleepy hamlet of Buitrago del Lozoya. Hauntingly quiet, we pass only three other people and its not even siesta time. Things they don’t tell you about riding a scooter… One, if you’re under five feet tall you won’t be able to straddle the bike effortlessly when stationary. You’ll need to adopt a quick-reflex ‘hop-off’ manoeuvre, distributing your weight to one side of the bike to support it (and you) from falling. Two, they’re heavier than they look, for a small girl anyway. Our initiation involves an obligatory safety briefing and introduction – throttle on the right handlebar, brake levers like those on a bicycle. Cue lots of bunny-hopping and over-zealous revving around the block to find our scooter legs. Three, if you have a basic centre of gravity and can ride a bicycle, you won’t struggle to master a Vespa. And like cycling, skiing or skating, it gets easier with speed, so the open road is a doddle compared to the training circuit. The joy of a touring holiday over a destination trip is that you’re far too busy soaking up the ride to worry about where you’re going to end up. Our weekend journey travels in convoy for 130 miles, taking a circular route from Navafria over the Guadarrama and Ayllon mountains. As A-roads turn to B-roads turn to winding mud tracks, so the surroundings bend and shape as you move. Sandstone buildings give way to black slate rooftops, limestone turns to granite. By dusk, weary but buzzing, we pull into the small family-run yet fully-equipped (yes, there’s Wi-Fi) rural hotel La Era de la Tia Donata. All wooden fixtures and terracotta touches, it’s reminiscent of an alpine ski lodge and big on charm. Here we are treated to delicious homemade pea soup, fresh bread and unexpectedly tasty cheese and milk pasties (like vegetarian dim sum parcels). It’s surprising how exhausting being on a bike can be, so the squishy sofas, warm welcome from staff and high thread-count sheets feel like bliss at the end of our long day. We stop for lunch – Spanish tortilla with onions and peppers – beside a disused bullring and an ancient clock tower. One word of advice: look up. Not only will you marvel at the storks nesting in crumbling chimney pots but you could also glimpse the region’s peregrine falcons with their awesome wingspans. For our second night, we navigate the cobbles of Sepúlveda on our two wheels, arriving before an impressive stone archway and a huge pair of solid wooden doors. 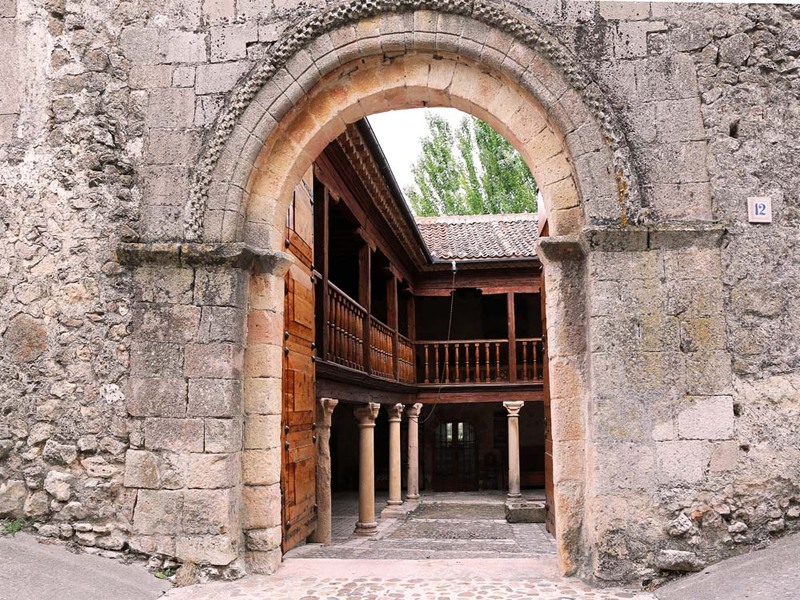 This is the entrance to the Posada de San Millán and it feels like stepping back 300 years. With muslin curtains billowing in the breeze, heavy antique furniture and crisp bed linen, it’s a little slice of luxury (and authentic Spanish history) that feels like only ours for the taking. 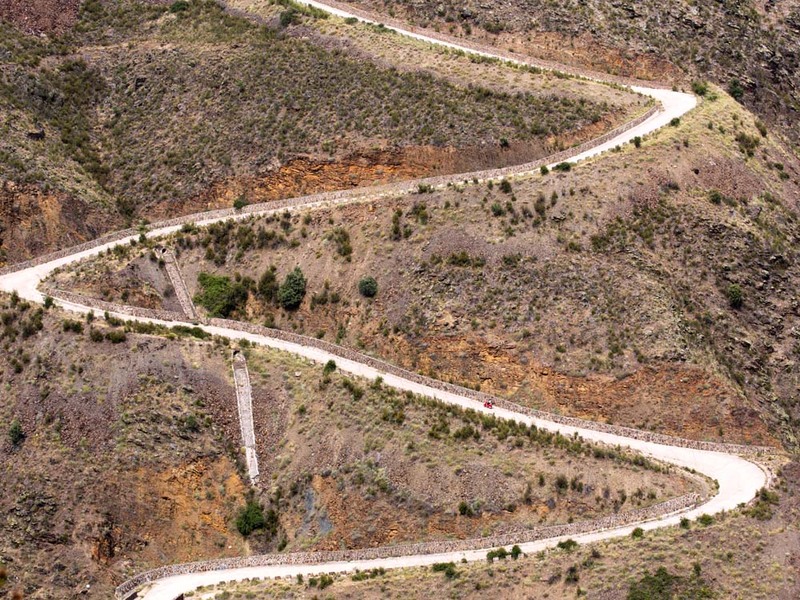 If off the beaten track is what you’re after, this is it. By the time we reach the last leg of our journey, the thrill-seeker in me is keen to crank things up a gear. A Vespa can hit up to 59mph but riding in convoy, book-ended by a support van and our brilliant, local tour guide Javier, there’s little scope for unleashing your inner Steve McQueen. My advice? Hold back from the rest of the group and ride at the back, giving you scope to slow and accelerate to your heart’s content. 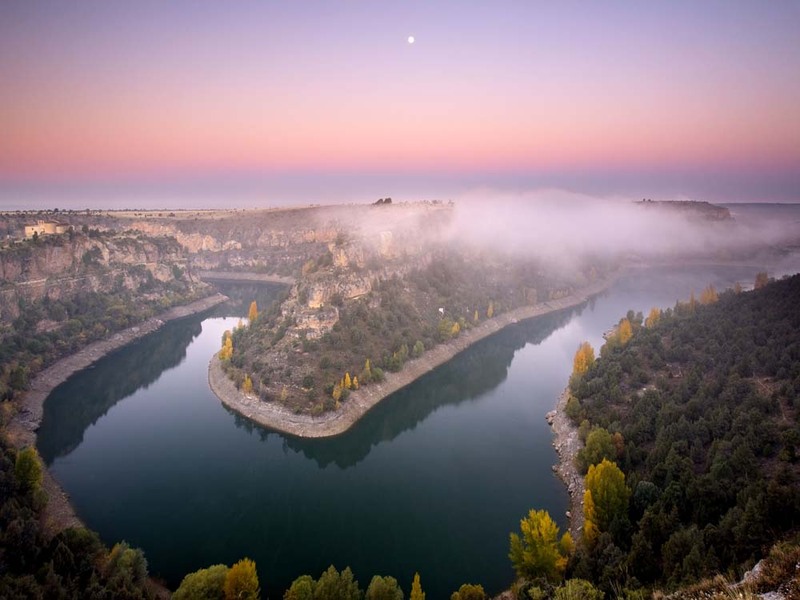 One of central Spain’s best-kept secrets is the Duratón nature reserve, where ancient, crumbling castles stand majestically on hilltops overlooking a vast canyon. There are endless photo opportunities at Ermita de San Frutos, a 12th century Romanesque monastery that’s been uninhabited for the past 100 years but still has a beautifully haunting chapel – superstitious types can crawl through its ancient ‘healing passageway’ to be cleansed of any ill health. It’s worth bearing in mind that the organisers of this trip, The Flashpack, offer bespoke trips for groups, so this is perfect for a hen-do with a difference, or as a friends and couples holiday with a bunch of like-minded people. No two trips are ever alike and the scope for seeing a new side to Spain is endless. Do enquire about watersports before booking, too – watching people kayaking along the snaking rapids of the Duratón canyon left me with a serious sense of missing out. But now I know how to ride a Vespa, and there’s always next time. 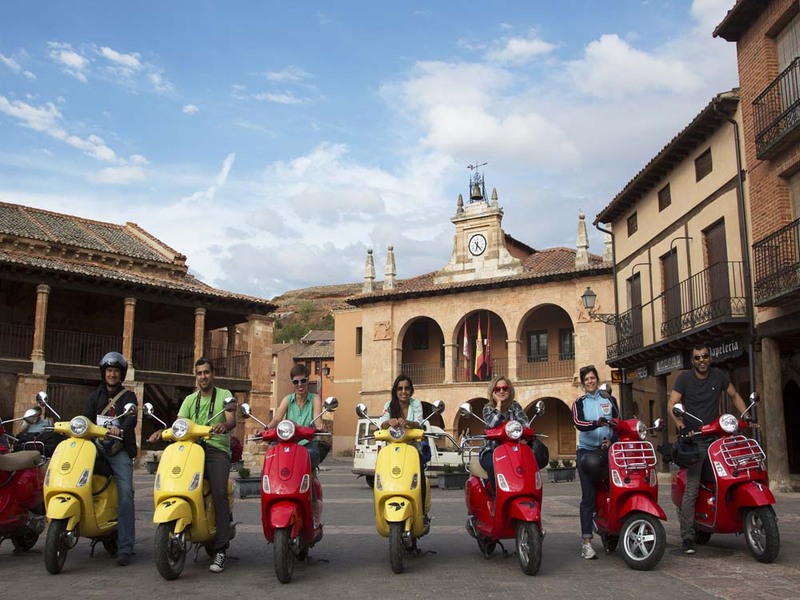 The Flashpack (theflashpack.co.uk) offers a four-day Spanish Vespa Weekend Road Trip from £989 per person including transfers, scooter hire, back-up vehicle, guides and three nights’ half-board accommodation including wine. You must hold a valid UK driving license for at least 3 years. Flights are extra – for the many options to Madrid see skyscanner.net.